Did you know that it's Grandparents Day today? We love our 'grampys' and 'grammys' and always want to make their time with our Little Jules extra special. And for those special days when Little Jules goes over to her grandparents', we dress her in the cutest, sweetest kids clothes we can find in her closet. Today, we would like to mention a few children's clothing brands that have been absolute hits among 'grammys' and even 'grampy' that shop at our online kids clothing boutique and that your little ones' grandparents are ought to love! 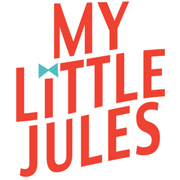 By now you probably already know that we love Le Top kids clothes here at My Little Jules. Let Top makes the sweetest brother and sister outfits and has been a #1 seller among grandparents. These adorable polka dot sister sets or fire truck big brother/little brother outfits will put a smile on any grand's face. For more brother an sister Le Top outfits, check out Le Top kids clothing section at My Little Jules! Our Little Jules grew up wearing Zutano! Grand parents love this brand for its sweet prints, comfort and commitment to make 100% cotton baby clothes (what can be better than that for gentle baby skin?). You can even find a few organic baby outfits! Our favorites this season are these Jungle Dream footie for the smallest girls and Have a Ball Footie for little boys. Shop our Zutano collection to find matching hats and other adorable baby outfits. Jelly the Pug is a beloved brand among all of our customers, but it has been especially popular among loving grandmas. The first two Jelly the Pug dresses have been the most popular for spring and the Hannah dress is a definite fall 2011 hit! Grandparents adore their little sweet peas and jitter bugs. Why not make hugs and kisses even more enjoyable with cuddly Kissy Kissy baby clothes made from 100% pima cotton - the softest cotton in the world! Grandmas and grandpas go gaga for these adorable and unique baby clothes and we can see why! Made in the USA, Cach Cach clothes have a distinct look and always feature fun appliques, ruffles and matching accessories. Visit our website to find even more cute Cach Cach baby and kids outfits! Any grandmas and grandpas out there reading this post? What is your favorite brand?